Da Ping Zhang is an exclusive area within the Jingmai tea producing region. Very old tea trees have thrived in this pristine mountain region for centuries. It is no accident that teas made from trees in this area are superb and worth collecting. At first sip, one can immediately notice the superior quality of the resulting brew. 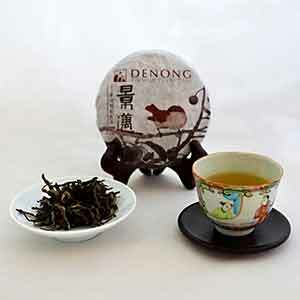 So pure, so soft and so smooth, the tea broth glides down your throat easily leaving a nice fragrance in your mouth. Teas of this caliber are rare and one can only imagine what these teas will become in a decade or two. Use 5g of leaves per 6 ounces of water. Rinse the leaves once with hot water (190º F) and discard the water. Start steeping and according to the recommended steeping time below.